There are currently 114,822 users on this website. 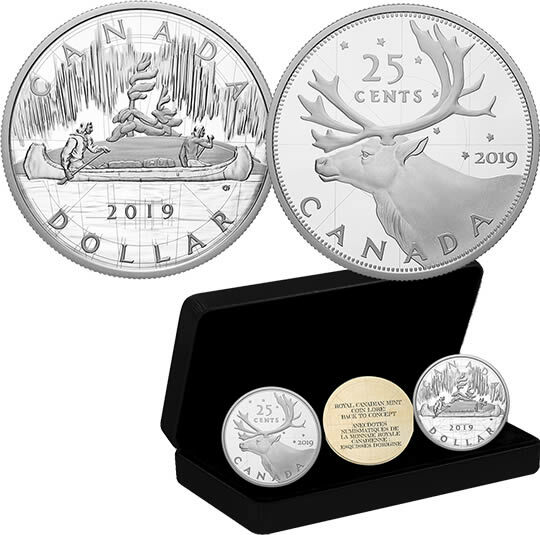 Royal Canadian Mint - The 25-cent coin re-creates a preliminary sketch of the iconic caribou design by artist Emanuel Hahn. 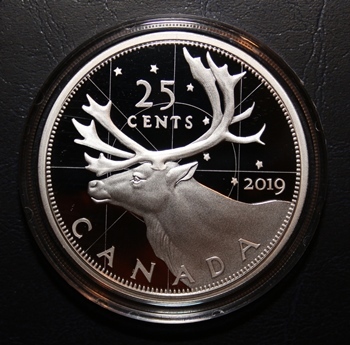 The Big Dipper asterism appears behind the left-side profile of Rangifer tarandus, while the denomination "25 CENTS" is positioned between the caribou's antlers. Laser engraving on flat mimics the artist's hand-drawn guide lines. The reverse includes the word "CANADA" and an updated date, "2019". 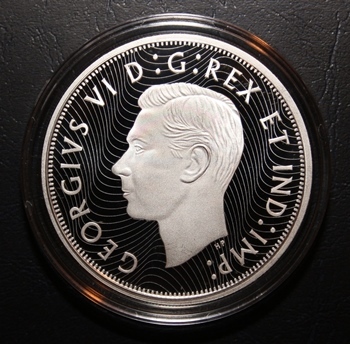 The obverse features the effigy of King George VI by T. H. Paget. 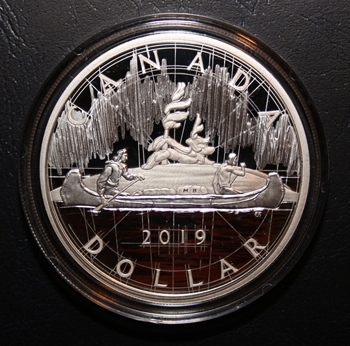 The $1 coin also features Emanuel Hahn's early take on the Voyageur design that eventually appeared on Canada's silver dollars (1935-1986). Beneath the aurora borealis, a voyageur and an Indigenous guide paddle a fur-laden canoe past wind-swept pines that rise up from a semi-circular island. Laser engraving on flat mimics the artist's hand-drawn guide lines. The reverse includes the word "CANADA", an updated date "2019" and the denomination, "DOLLAR". 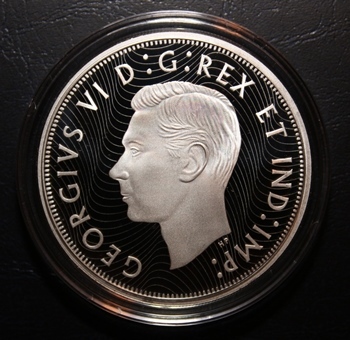 The obverse features the effigy of King George VI by T. H. Paget. 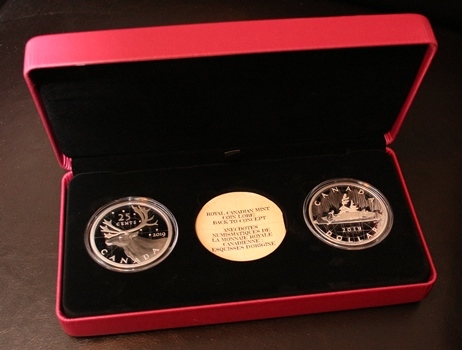 Ordered this set because of the Voyageur dollar, which is my favourite Canadian design. The coins are very well done. Interestingly, the set came in a maroon clam shell, not a black one as in the photo above. Congrats for getting the set, and thank you for sharing! I would be getting the Voyaugeur, would it be stand alone coin in 36mm SD format (like 1935-2010 SD). RCM sometimes very good in what they are minting for NCLT, but usually it very nichshe items. Great looking set. Seeing the actual photo, I'm liking the caribou more than I thought. Thanks for sharing! They create something kind of cool but the obverse finish, what's that ? Interestingly, on todays Coin Show, Steve Bromberg says there is a mistake on the Voyageur Dollar, He says it should be King George V on the back of the coin, not King George the VI (the Queen's father) which is on the coin. Funny, not one has picked this error out. King George the 5th was still alive in 1935, the release year for the original Voyageur. Hypnotic ruse to hide surface defects.